In my Manhattan bunion surgery practice, patients frequently inquire about laser bunion removal. Because lasers are often associated with advanced techniques in medicine, most people assume that a laser can zap away their bunion, even though many patients are not exactly sure what a bunion is or what a laser can accomplish. It is my experience that patients don't really care if their bunion was repaired with a laser, telescope, or a stethoscope. What patients want is the bunion gone with a nice cosmetic result and little downtime. 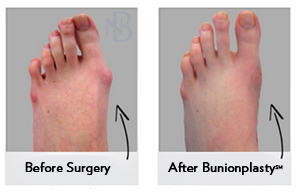 Bunions Are Fixed, Not Removed. Most people incorrectly believe that a bunion is an overgrowth of tissue and bone, and this is why they incorrectly assume a laser can blitz their bunion. A bunion is actually a maligned big toe joint that results in the underlying bone being pushed outward from beneath the skin. The misconception that lasers are good for removal of bunions stems from patients incorrectly thinking that bunion surgery involves removal of a bunion. Rather, bunion surgery involves realignment of the deviated bones with special bone cuts or bone mending (Lapidus Bunionectomy) techniques. The Wall Street Journal featured an article on the various approaches to bunion surgery. A laser would actually be detrimental to bone cuts, as the heat of the laser would burn the bone, thus prevent proper healing. The benefit of lasers in bunion surgery are focused on the soft tissue aspects of the procedure, with the skin incision and the tissue augmentation. However, these benefits have not been proven to show any improved outcome in function or appearance with bunion surgery. What Are Patients Searching for Laser Bunion Removal Really Looking For? Most patients, in my experience, who are searching for laser bunion surgery just want a modern bunion surgery that results in a foot that looks good with little downtime. The most modern techniques in bunion surgery today do not call for lasers at all. Improved cosmetic result: Central to any bunion surgery is the proper realignment of the deviated bones. If this is properly performed, the appearance of the bunion will be gone. This is only a portion of the cosmetic outcome. Surgeons can perform plastic surgery techniques to limit scarring, which can be helpful. Some surgeons keep the incision off the top of the foot, which is popular for smaller bunions. The Bunionplasty(SM) procedure allows for all sizes of bunions to be treated with a hidden incision, which is made possible by specialized implants to hold the bone in the proper position. Quicker recovery: Modern techniques allow for patients to mobilize quicker than ever before. It takes six weeks for the bone to mend in a corrected position, and that can't be altered. What can be changed is how mobile patients are during this process. It used to be that small and moderate bunions were mobilized quickly and those with large bunions had to suffer in a cast and crutches. Nowadays, specialized bone fixating implants have allowed some to forgo the prolonged casting and crutches. In summary, if you are looking for the most modern techniques in bunion surgery, laser is not currently the best option. What is encouraging is that bunion surgery has changed dramatically in the past few years as surgeons are more focused on both the aesthetic and functional result. To learn more about Dr. Neal Blitz, please visit www.BunionSurgeryNY.com.